Master repair technician, George Bunk has logged over 35 years at the bench. George has a machinist’s mind and has been the go-to saxophone repair tech in the St. Louis area since the early 1990’s. George apprenticed under Steve Williams and Blaise Buchanan in the early 1980’s at Midwest Music Repair. He then refined his craft in brass and woodwind repair at McMurry Music in St. Louis where he served as shop manager over the course of the next 20 years. Saxquest was very fortunate to bring George onboard in 2008. George graduated in 1976 as a music performance major from UNLV where he studied saxophone under Ralph Gari. George is a multi-reed instrumentalist performing regularly on clarinet and flute as well as saxophone. Performance credits include a stint with the Las Vegas Symphony Orchestra as well as traveling the United States with territory bands such as the Don Glasser Big Band and the George Doehner Big Band. George has been a member of the sax section of the Original Nights of Swing since 1986, St. Louis’s oldest continuously running big band. He currently plays weekly with this group throughout the St. Louis area. Cornelius “Chris” Funck began his career in band instrument repair in 1989. Raised in a family of instrument repair technicians, Chris learned the trade from his father and uncle at an early age. He was privileged to apprentice under several of the countries leading musical instrument repair techs including Karl Knox, Judd Carver, Howard Funck and Alan Webb. Chris founded Mid-America Band & Orchestra Repair in 2007 and began to work for Saxquest in 2010. In 2012, Chris started an instrument repair training course at Saxquest where he holds weekly training sessions with local interns. Every great repairman I’ve known was a tinker at heart. The desire to know how things work and the ability to figure it out for ones-self is a priceless trait. Chris exemplifies this mind-set and is essential to the Saxquest repair team. Chris is also an active player in the St. Louis area. From 1991-1999 his playing for the Department of Defense took him around the world, playing USO shows in US Military Clubs and Embassies as far away as Greenland and Kuwait to Saudi Arabia and Bahrain. In the St. Louis area, Chris is known for his R&B and classic rock playing where he has played regularly with such bands as Paradise Alley, Interstate Blues Connection, Brown Beans & Ham, Terra Nova, Trilogy and many other local bands. Ben Reece began apprenticing instrument repair from Saxquest’s Chris Funck in 2007. He was a quick study taking to the trade with eager ambition. Ben is one of the top call jazz saxophonists in the St. Louis area playing with several local bands and working as a recording artist. He developed a deep appreciation for jazz at an early age, formalizing his passion by receiving his Bachelor’s and Master’s degrees in jazz performance from Southern Illinois University-Edwardsville. There he studied with two of St. Louis’s top saxophone mentors, Mike Karpowicz and Jason Swagler. Ben has been a part of the St. Louis Music scene since the late 1990’s and currently plays 100+ gig a year. He has been a woodwind instructor in both the private setting and in the public/private school sector. Ben can currently be heard performing with the Jazz St. Louis Big Band, the Phil Dunlap Quintet, and the Saxquest Nonet Jazz Orchestra. Audrey Denny recently joined the Saxquest repair team as our clarinet specialist where she repairs, sets-up and play tests our clarinets. Before arriving to St. Louis, Audrey apprenticed in clarinet repair with Morrie Backun and Elaine Ward at Backun Musical Services. She also worked for Conn-Selmer, Inc/Leblanc Division where she worked as a clarinet tester and instrument technician. At Saxquest, Audrey has apprenticed under George Bunk and Chris Funck. Audrey obtained her Bachelor’s of Music Degree from DePaul University in 2000 where her primary teachers were Larry Combs, Julie DeRoche and John Bruce Yeh. As a free-lance musician in Chicago, Audrey performed concerts with the Chicago Symphony Orchestra (CSO) under the direction of Christoph Eschenbach and Cliff Colnot. She was a regular member of the Civic Orchestra of Chicago in 1999 when the orchestra made its debut at Carnegie Hall under the direction of Daniel Barenboim. Audrey was also a member of the Barossa Quintet and was a lecturer at DePaul University where she taught clarinet methods to music education majors. She has also played with the orchestras of Elgin, Kalamazoo, Kenosha, Northbrook, and South Bend, as well as the Illinois Philharmonic, The Highland Park Opera Theater, Concertante di Chicago, and the Chicago Shakespeare Theater. Derick Tramel has been apprenticing repair in the Saxquest shop since 2010. Derick has a great feel for the instrument and works on our new horn set ups. A gifted low-wind specialist, Derick graduated from Webster University in 2010 where he studied saxophone with Paul DeMarinis and Mike Karpowitz and bassoon with Robert Carter. Derick is also an active musician in the St. Louis area and has worked as a multi-reed instrumentalist with the St. Louis Philharmonic Orchestra and the St. Louis Reparatory Theatre. Derick has played bari sax in the Original Knights of Swing and currently plays the bari chair in the Saxquest 9-piece Jazz Orchestra and in Al Holliday and the East Side Rhythm Band. Josh Creekmore is our latest hire in the repair and we’re delighted to have his talents. He began apprenticing band instrument repair in early 2013 with Rodger Enloe at Shoals Band Instrument Repair in Florence, Alabama. After completing his Bachelor’s degree in Commercial Music at the University of Northern Alabama in 2013, Josh moved to St. Louis in 2014 to pursue a career in instrument repair. 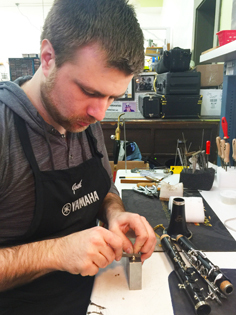 Bringing with him a passion for the restoration and preservation of vintage instruments, Josh now apprentices in the Saxquest repair shop, eagerly soaking up the wisdom of George Bunk and Chris Funck, as well as constantly researching the repair techniques of other technicians around the world.